Over 112.5 million donations of blood are collected each year, but most of these contributions are unusable for some of the patients most in need. Blood transfusions must match the blood type of a donor to that of the recipient; otherwise, the recipient’s immune system could attack the foreign blood, causing severe illness. Today, scientists at the 256th National Meeting & Exposition of the American Chemical Society report promising new steps towards hacking this system, using bacterial enzymes derived from the gut microbiome to convert restrictive blood types into more universal blood. 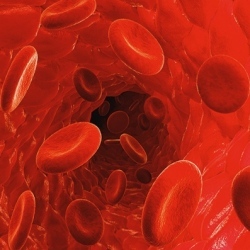 There are four main types of blood: AB, A, B and O blood, distinguished by the sugars red blood cells carry on their surface, called antigens. AB is the selfish hoarder of the group, carrying both A antigen and B antigen. With all its bling, AB blood can only be transfused into others with the AB blood type, but people who have AB blood are universal recipients. A and B blood types carry just one of the two antigens, respectively, and people with these blood types can only receive blood that doesn’t sport the other sugar. O blood, on the other hand, is the naked martyr that lacks the sugars that decorate its brethren. Its comparatively barren state makes it a friendly presence in almost all immune environments, and O type blood—the universal donor of the bunch—is in constant demand. To meet the disproportionate need for universal blood, banks and donation centers are constantly on the lookout for these desirable donors. But even though around 40 percent of the population is type O, stocks always seem to fall short, partly because stored blood has a relatively short shelf life. In recent years, scientists have begun to experiment with generating type O in the lab—either by synthesizing red blood cells from scratch, or snipping the offensive sugars off of AB, A and B blood. Last year, a group of researchers led by Jan Frayne made enormous strides with the former strategy, infecting a line of red blood cell precursors with cancerous genes to provoke them into replenishing themselves ad infinitum. However, this technique is far from entering the clinic—the synthetic cells have yet to be fully vetted for safety, and the cost of filling just one blood bag with these analogs remains astronomical. On the other hand, converting blood types has been a work in progress for decades. This strategy is especially appealing because it could both create more universal blood while preventing harder-to-use donations from going to waste. In 1982, a group of researchers took the first promising steps in artificially converting blood types. Using an enzyme isolated from unroasted green coffee beans, they snipped B antigens off red blood cells, effectively creating type O blood that could be transfused into human patients. But the coffee enzyme had its drawbacks. For one, it was finicky, requiring a very specific set of conditions to work—which meant putting the blood through the ringer before it could be used. Even when the experimental setup was just so, the enzyme was sluggish and inefficient, and the researchers had to use gobs of it to see an effect. Still, the discovery of the coffee enzyme signaled to the rest of the world that blood conversion was possible—and, more importantly, the necessary tools likely already existed in nature. By the early 2000s, an appreciation for the immense diversity of enzymes in the bacterial kingdom had begun to emerge, and researchers began to turn to microbes for their sugar-slicing needs. In 2007, researchers reported the discovery of two bacterial enzymes that, in combination, were capable of hacking both A and B sugars off of blood cells. The enzyme that sheared B antigens off blood was a thousand times more efficient than the coffee enzyme from 35 years prior. But the enzyme that targeted A antigen produced slightly more sobering results, requiring too high a dose of enzyme to be practical. Several teams of researchers since have attempted to harness the power of microbes to “unsweeten” blood. But a few years ago, Peter Rahfeld and Stephen Withers, biochemists at the University of British Columbia, decided to turn to a yet-untapped resource: the gut microbiota—the teeming community of industrious microbes that live in the human intestine. As it turns out, “gut microbes are professionals at breaking down sugars,” according to Katharine Ng, who studies the gut microbiome at Stanford University, but did not participate in this work. Sugar-laced proteins line the wall of the intestine—and some of these elaborate sugars resemble the same A and B antigens found on blood cells. What’s more, many gut microbes harvest these sugars by plucking them off the intestinal lining.